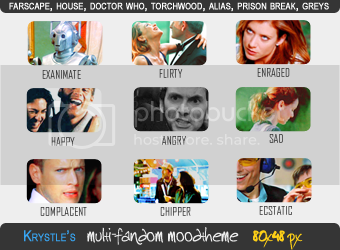 Remember those days when the only icons I made were from Alias? Well, let's relive that moment for about a second because I made a gazillion of them!xD Yes yes, no House icons in this post. I forbid myself to make any knowing if I started on one, I won't stop. lolz. No worries though. The next update will contain some goodies. I just felt the need to do this first. Btw, don't think I'll get some holiday icons done. I just don't feel the Christmas spirit for some reason. Who knows.. I could instantly change my mind? rules// credit to intodelirium or krycons ; do not edit ; do not steal ; comment if you're taking something or for feedback ; noms are much appreciated but plz inform me ; TEXTLESS ICONS ARE NOT BASES! MELISSA GEORGENESS. I love your icons so much. Snagging some Irina, J/I, Starbuck and Boomer icons. Thanks! snagged #10- I love that outtake. Thank you! These Alias icons make me miss the show so freaking much. *sigh* I love 6, 13, 24, 26, 30, 31 and 40. BSG! :O Lol @ your new OTP; i dig that. I love your use of textures. Snagged several of the BSG ones. oh oh I am finally watching the last season of Alias right now so thanks for the reminder icons cool!! Taking 44 (sarkyyyyyyyyyyyy) & 50 is one of the prettiest little 100x100 square i've ever seen. "..we've got something kinda funny going on..."
Lovely! Only taking BSG 8 and 15, but man, your Alias icons take me back. Your cropping and coloring is choice!